Thanks to a sunny and temperate climate, California is home to some of the most beautiful flowers in the world. California's wide variety of topographic climates make it home to more than 6,000 flowering plants, including about 2,000 different wildflowers. While California has a long dry season, the wet part of the year gives birth to rich varieties of annuals famous for their bold and impressive colors. Flowering between February and September, this official flower of California favors open and grassy areas. 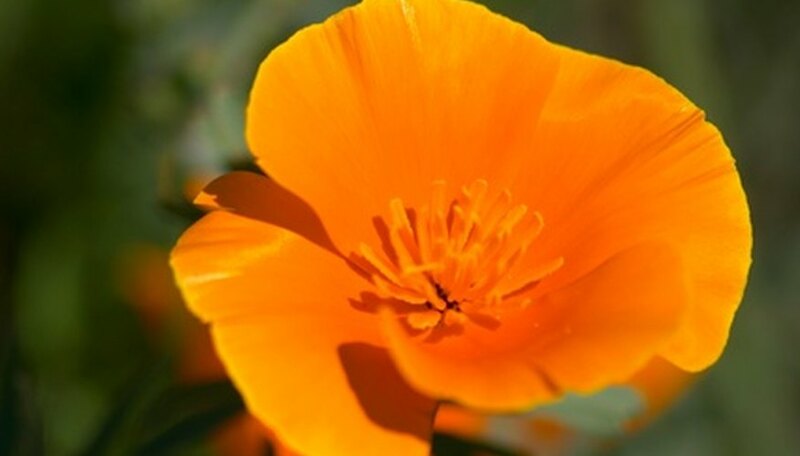 Native Americans used the four-petal red and orange flowers medicinally. Despite a common misconception, cutting these flowers is not illegal under state law. This erect California shrub grows 1 to 3 feet tall, boasting flowers that form large tufts of silvery or rusty hairs. These tufts have earned it the name "winter fat" despite the fact that it grows in the desert north of the Sierra Nevada and Cascade mountain ranges. One of the most colorful California desert wildflowers, desert mariposa's blooms grow in clusters, in shades of vermilion to orange, often with brown-purple spots on the base. The plant appears commonly in open and bushy spaces between 2,000 and 6,500 feet of elevation. Also known as painted cup, this California mountain flower has a long, tubular corolla with modified lips. The upper lips are elongated and enclose the style and stamens, while the lower lips are shorter and somewhat sac-shaped. Paint brush grows along streams and wet places below 11,000 feet. Also known as panther lily, this mountain wildflower is one of California's most conspicuous lilies, with stout stems that can grow 3 to 8 feet tall. The nodding flower has anthers about 1/2 inch long, and its yellow-spotted perianth segments curve in the middle. The leopard lily grows in large colonies on stream banks below 6,000 feet in the Sierra Nevada and Humboldt County. This annual flower of California grows 1 to 2 feet high with flowers of 1- to 3-inch diameter in pale yellow or cream. The flowers bloom in April and May. Blazing star is common on rocky slopes below 2,500 feet, from Alameda County to Santa Clara County.